Halloween ain't just for kids! Adults love this holiday, too. And with the Halloween cocktail recipes here, they'll love it even more! 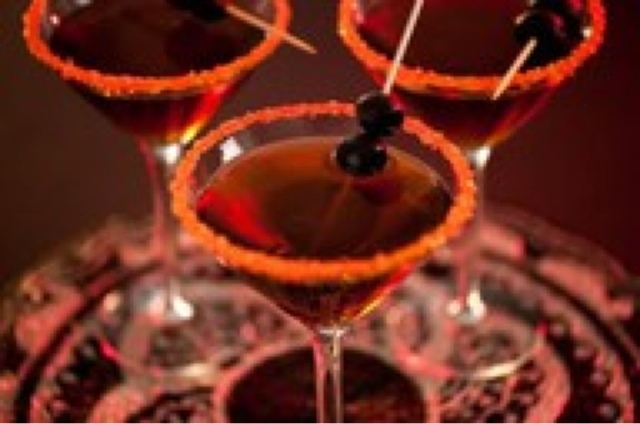 These Halloween alcoholic drinks are wonderfully tasty, easy to make, and look wonderful for Halloween. Some are elegantly creepy, while others are downright gory. Take your pick! In addition to specific recipes for Halloween alcoholic drinks, I'm also including lots of tips for making any cocktail recipe creepy-looking for Halloween. This includes creepy-colored sugar rims for cocktail glasses and how to decorate your cocktails with gooey blood on the inside. Also, if you're looking to make up your own spooky Halloween cocktail recipe, here's where you'll find a list of some of the best Halloween colored booze and liqueurs. Any drink becomes a Halloween cocktail when the glass is decorated right. Below, you'll find instructions for doing blood-dripped cocktail rims for Halloween drinks, or pretty (or creepy depending on how you do it) colored sugar rims for cocktails. 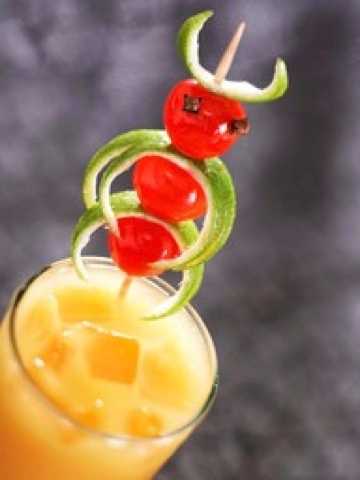 Simply garnish with a severed finger or a couple of eyeballs and you've got yourself one very creepy drink. When it comes to making a rim of blood for your Halloween cocktail recipes, you have a couple of options. You can do a cooked mixture of corn syrup and sugar (with red food coloring) to make a candy blood that will stay in place all night. But that mixture will also stay in place the night after that and after that and after that. The stuff is impossible to get off! I find the recipe below to be a nice compromise. It stays in place well (especially on a cold glass), looks nice, but is easy to clean with a bit of hot water. 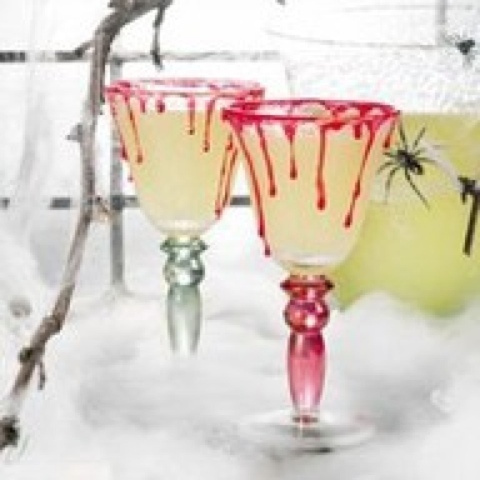 A blood-rimmed glass looks great with a vampire kiss martini or any other creepy drink. But since the blood runs down the inside of the glass, it also looks really striking with white-colored drinks, such as Bailey's Irish Cream-based drinks. Play around with it to achieve your favorite look. 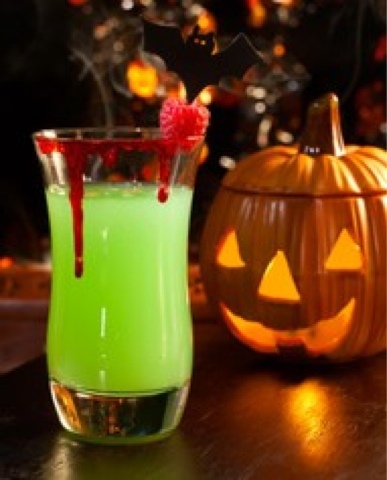 With some Halloween cocktail recipes, you may want to go green-- this effect looks really cool as "slime" or "ectoplasm." Instructions: 1. Place honey or corn syrup in a small cup or bowl. Add red food coloring as needed. If using regular food coloring, you'll probably need about 12 drops or so. If using more concentrated food coloring, use less. 2. Either place this mixture on a small plate and dip the rims of your glasses in it, allowing it to drip down, or use the end of a spoon to do this manually. The second option is cleaner (it assures you don't get any drips on the outside of the glass) but more time consuming. Tip: If it's warm in your home, keep the glasses cold to keep your blood from dripping too much. Colored sugar is even easier to make, and looks wonderful on the edge of a martini glass. You can choose to do a fun combination of colors like I did here, or stick with a single color. Green looks great for "slime" or red for "blood." I also love using plain black sugar with a black cocktail for understated creepiness. Instructions: 1. In a small bowl stir together sugar and food coloring with a fork until well combined. Gel food coloring works best, though it's a bit harder to mix. 2. Place your colored sugar on a small plate in a pattern (as pictured) or as desired. 4. Dip glass carefully into the sugar, shifting it a bit to coat evenly. 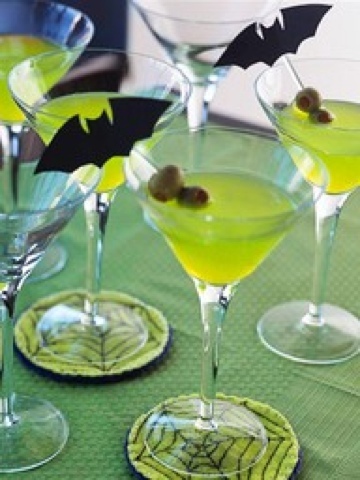 This Halloween cocktail recipe is fresh and delicious and a bright lurid shade of green. Your guests will go "psycho" for it. Be sure to decorate it with a few plastic eyeballs to get the full effect. Instructions: Mix ingredients and serve over ice. Garnish with cold eyeballs . Makes 1 drink. 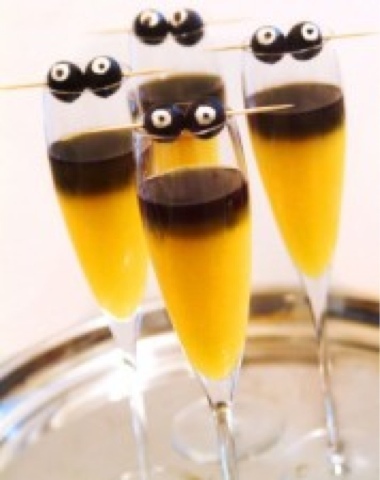 This Halloween cocktail is so much fun! It looks just like a scoop from your favorite Louisiana swamp... but tastes wonderful. Why? Because it's actually just a mojito that's made just a little differently, and with a few special ingredients. 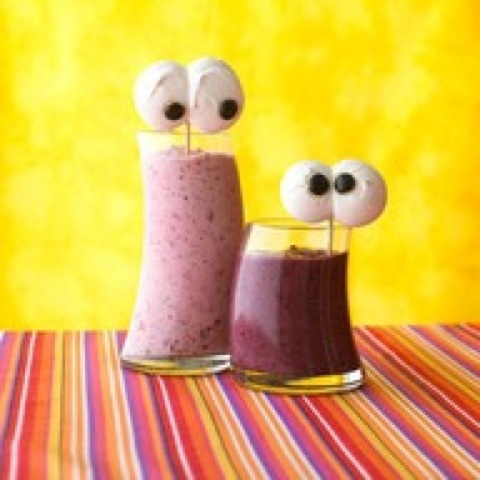 In my version here, I've used blueberries to look like little stones. But you can skip that if you like-- it looks great either way. Instructions: 1. In a cocktail glass, combine the brown sugar, lime juice, and mint. Pound together to break up the mint and bring out its flavor. 2. Fill the glass up about three-quarters of the way with crushed ice. Pour the rum over. 3. Add club soda, and a splash of cola to give it a swampy color. 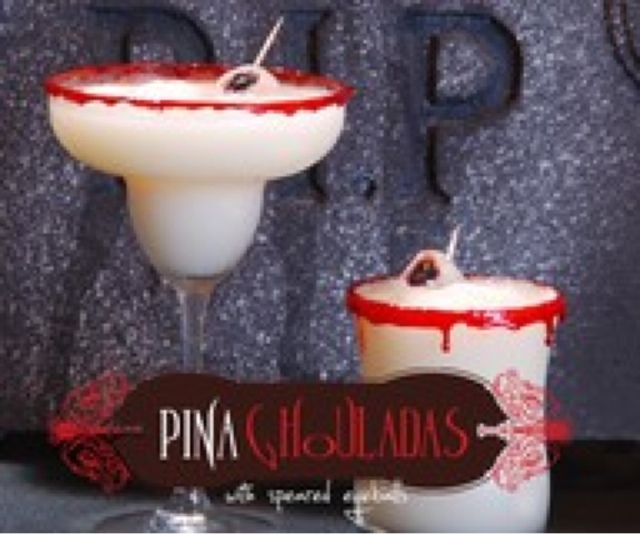 These two are probably my favorite recipes for Halloween alcoholic drinks! They both look so pretty and elegantly creepy. 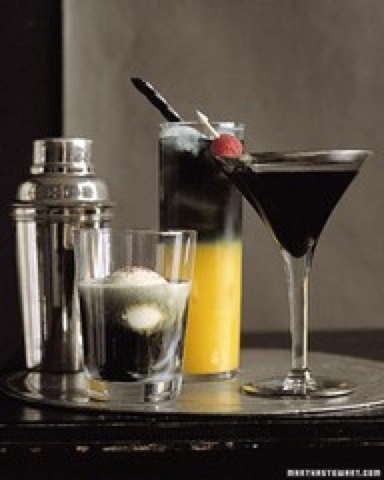 For best results, serve either of these Halloween cocktail recipes in very plain cocktail glass (like the ones pictured) to highlight the colors. Both of these drinks have a lot of vodka and are very strong... and since the ingredients are separated for effect, be sure to serve both of these Halloween cocktail recipes with a swizzle stick (I like to use severed fingers as Halloween swizzle sticks, for example) so your guests can mix it up before drinking. Instructions: 1. Fill a small cocktail glass with ice. 2. Pour your choice of cranberry juice (for a black widow Halloween cocktail) or pulp-free orange juice (for a spooky screwdriver) over the ice. 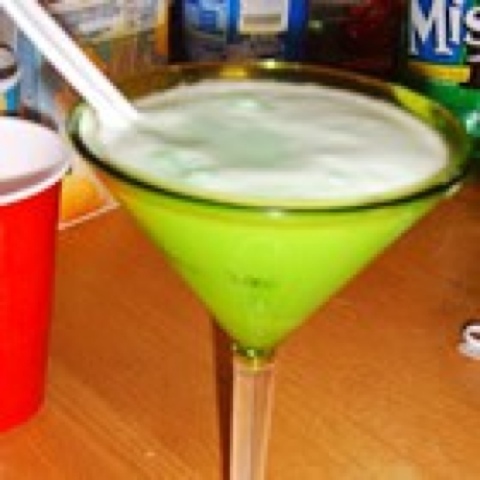 This Halloween cocktail recipe was created by Kaluah, and is one of the tastiest alcoholic drinks for Halloween that I make. The combination of coffee and citrus is surprising and really, really interesting. And the black color is perfect for Halloween! For a really cool effect, garnish this creepy cocktail with a wedge of blood orange. Instructions: 1. In a cocktail shaker with ice, combine the Kahlua, cognac, Cointreau, lemon juice, and simple syrup. Shake until well mixed. 2. Strain into a chilled martini glass decorated with some of the techniques outlined above, if desired. You don't always need a special recipe to make a creepy Halloween cocktail. You can choose any recipe you love, or even make one up yourself. When you're leafing through your favorite cocktail recipe book, it helps to know what kind of booze or mixers will naturally lend a Halloween-y color to your cocktails.